This article is for GUNBOT 332 (out of use) – an old version . Ok, first of all, this is an announcement: GUNBOT v3.3.2 GUI edition is out!. So why this announcement? Because before you get your hands on this piece of software, I want you to think: all past months have been exciting, entertaining and you have been a part of it! Together, we built this bot, we discussed, we shared ideas, we pondered every single option, price, setting: until now. It has been a win-win: I have coded our common ideas and sold licenses, you have used all previous versions and patches and your BTC balance makes you smile now. Some of you posted on this forum their results, some didn’t: I want to thank you all, announcing this is not the end: this is our “start”. The software is considered now out of beta and by now, we are ready to make serious money with it. That’s why, I want to share with you the way I run it, the way I configure it, and the way I take profits out of it. You have been provided a download link: it is a zip file, double click on it and unzip it on your desktop or any other folder you want. Add your API keys and SECRET and select your Market . When you create a new API key, everything needs to be enabled but withdrawal and deposit: as long as you don’t enable those 2 options, you are safe using the bot, none will ever be able to access your account and move your assets out of the exchanges. It is a good idea tho, to never share your “secret” key with anyone ! The “Markets Settings” section is very important: this is the place you select what pairs you are going to trade with GUNBOT and in what exchange. Actually Poloniex, Bittrex, and Kraken are available, but we are going to implement any serious exchange out there. You don’t have to worry about the spell of the altcoins: write BTC for bitcoin on all exchanges, without worrying about Kraken calling it XBT or another exchange calling it differently: the bot does that internally and when you write BTC or ETC, your GUNBOT knows what to call it on the different exchanges. Take into consideration the primary coins issue tho: i.e at poloniex there are 4 primary coins: BTC/ETH/XMR/USDT. If you want to trade BTC against USD Theter you need to respect what poloniex tradable assets are: they call it USDT/BTC and not BTC/USDT. Also: when you first start to trade a pair, you need to have a balance in the primary coin and possibly no balance on the “altcoin” (please note that in the case of USDT/BTC, bitcoin si considered altcoin). So: if you want to trade USDT/BTC, you need to have Theter Dollars on your balance. Fill the coins pair and the market in the Markets Section and press “Save settings” button: a confirmation message will appear if everything went smooth. There is a combo box to select one of the 4 strategies for each order set: you can decide to use Bollinger Band (BB) to buy and Stepgain to sell, or you can buy at a fixed price (or better) using PINGPONG and you can sell at a fixed % using GAIN strategy. The GAIN section allows you to set a % for both buy and sell orders: the bot will buy x% below the lowest EMA (or better price) and will sell at x% above the price you bought (or better). These settings are very important to set even if you are not using the GAIN strategy: this values, indeed, are “safe” values the bot will never sell or buy above or below this. I.e. : if you are using Bollinger Band strategy, sometimes the Bollinger Band are too tiny (or not completely calculated yet). In those cases, the bot would use a safety price to sell, which is the GAIN setting: it will never sell at less than that. Be sure to have the correct value for it! The next section is my favorite: the Bollinger Band. Well…a lot have changed since that post and we developed the Bollinger Band as a strategy. You can set % values in Low BB and in High BB: the bot will buy only when the price goes x% above the lowest BB (or better price) and will sell only when the price will go x% below the highest BB (or better price. The PINGPONG section is interesting too: if you see a coin doing side moving and reaching the same price up and down repeatedly (DOGE ?) this could give you good profits: set a price to buy and a price to sell and the bot will keep buying/selling at that price (or better). I’m not a big fan of the next section because the natural evolution of STEPGAIN has been Bollinger Band. But I see reputable members of the GUNBOT community that are doing huge profit with this strategy. You specify 2 levels of buy and 2 levels of sell (buy below EMA and sell above the price you bought). Say you set buy level 1 to 2% and buy level 2 to 5%: the bot will try to reach the level you set in “Level to use for buy orders” (1 or 2: in the example above would be 2% or 5%). Sell Level 1 to 2% – Sell Level 2 to 7% > Level to use 2 > the bot will sell when the price will go between 7% above the price you bought and Highest Bollinger Band: if it fails it will buy at 2% or better. Confused? Use Bollinger Band : it is a natural extension of all of this that lets you explore from GAIN setting to BB or better. Max Balance to trade is the amount of BTC (or primary coin) you want to use per each trade: in this case, it will buy 0.01 BTC worth of altcoin and will sell them at profit, using your strategy. If you are afraid of falling coins, you can protect your balance using the Security Margin: in this case, the bot would sell all your bought altcoins, if the price reaches 60% down the price you bought. You can play with this limit: there are people running GUNBOT with a very small margin, so they sell the bought coins at a loss if they go down after they bought them and the bot moves on to look new entry points: it is a way to not hold bags! Please use this setting with caution: the bot sells at a loss when the security margin is reached! – Max latest prices indicators: there are 2 of them, max latest prices and max latest prices trend. The first one is used to store prices and calculate Bollinger Band. Unfortunately, poloniex/bittrex/Kraken don’t send us Bollinger Band, Ema, Candlesticks back with their API: we need do to maths by ourselves using prices. While the exchange gets one price at every microsecond as long as their order book gets updated, we are limited to the API calls limits to gather prices: one every x seconds you set bot delay time. The Max latest prices for BB calculation are fine to 300: you can play with that number and compare results with exchanges. The Max latest prices for the trend watcher is interesting too: using the trend watcher, GUNBOT can see downtrends and uptrends. It will follow downtrends for the buy orders and despite any strategy you use, it will always try to get a better price: when a downtrend is over it is time to buy! The same happens with uptrend: the bot follows them and when the uptrend is over (the price trend reverses), it is time to sell! Using 30 latest prices is fine if you increase that number the bot would become less reactive, if you decrease that number, the bot would become more reactive. There are 3 bot timings: bot delay, bot on fail and need faster/slower. You can play with the first 2 of them in this section. Consider all exchanges have an API call limit in seconds: i.e. on poloniex, you can’t send more than 6 API calls per second. If you are trading a lot of pairs and you have Time delay time and bot on fail time too short, you risk being banned. The Time delay time is a number of seconds the bot will wait before to update prices and statistics. The Bot of Fail delay is used if an API call fails: it will retry after x seconds you set in that config value. A reasonable timing for up to 10 pairs is 60/30 in this couple. For over 10 pairs up to 20-25 pair, is reasonable to double those values to 120/60. If you go higher than 20-25 pairs, I suggest you use 2 or more different API keys: you don’t have to pay for it, you can generate new API keys and send them to me to be added to your license. Beware tho: do not abuse exchanges limits, we are welcome at exchanges with our bots because we generate fees, but the system needs to be workable for everyone. 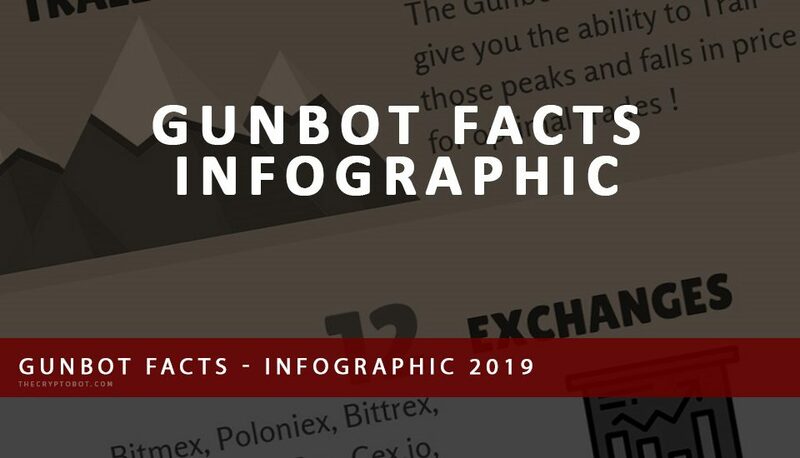 Any abuse of API calls made with GUNBOT is highly discouraged and if it happens to you and you don’t stop your bot and use reasonable bot timing, we may suspend your license until you comply with the exchange’s limits. So…we are done with settings…what’s next? A confirmation message would appear saying the settings have been successfully saved. Again a confirmation message would appear asking you to wait sometime and give the bot its time to collect everything it needs to start trading and connect to the desired exchange. So what does your console says? These are the basic information about the exchange we are trading, the coin pairs we are using in this instance and their available balances to trade: in this case, we will use those BTC to buy and we will have to sell those ETH. Here you can see prices: the Last market price, the maximum price the bot would buy (but it will try to get a better one) based on the strategy and settings you using, the minimum price the bot would sell (but it will try to get a better price) based on the strategy and settings you using, the price you bought in your last buy order and the price for the security margin. Now, try to play a bit with your bot and see how those prices would change if you change settings. But how to change settings? Go back to the configuration tab (the X4 Edition tab), change the coin name and the market (polo, rex, Krak) you are trading that pair and press the LOAD SETTINGS. It will load the settings you previously saved for that pair: now change i.e. the BUY LEVEL in the GAIN section and press SAVE SETTINGS. Go back to the trading pair tab and observe the Price to buy: it changed following the % you just changed. You can play with any settings and observe the console reacting to your changes LIVE. The picture below shows an important part of the GUNBOT core: the trading. It shows you the last trading attempt timestamp and indicates the results: in this case, it is saying that it is waiting for a good price to sell but it can sell yet because the last price is too low. It also indicates that it doesn’t need to be faster and it doesn’t need to be slower. This is an important concept: when the price gets closer to the target price to buy or the target price to sell, we need to move faster! We did talk about the API call limits: if you set a bot timing too short, you may get banned. Don’t do it: let the bot do the job for you. When it is needed, the bot knows how to speed: it does it in the correct way, without exceeding the API call limits and it does it only for that pair and only for the time it is needed. For example, the price is getting close to the target price to sell: we need to be fast or we may risk to lose the price and not able to sell. In this case, if you have a bot timing very high because you are trading a lot of pairs, the bot ignores all of that and uses its own timing, in the right way, respecting the exchange rules and being fast enough internally to not lose the ride . The section below shows your trading results: the last buy order description, the last sell order description and the total profit you got in the actual session. When you decide to close the bot, you can withdraw that amount from the exchange! If you leave that profit on your balance tho, the bot will reinvest it the next time you start. The last part of the console shows all actual settings for that pair so you always know what settings you are using, without having to go back to the configurator and “load settings”. Well, this is all…what’s next? Oh right….the way I run it…. Ok, do this: use pure BB, you will have time to speculate and study your own strategy. Set lowBB and highBB to values between 20 and 35 (for example lowBB 21 and highBB 29 or lowBB 24 and highBB 27 or any other value you wish. Make a selection of at least 10-15 coins and start them all with those settings on pureBB. In 1 week, come back here and post your results!